Use the proper marking tool for your fabric. 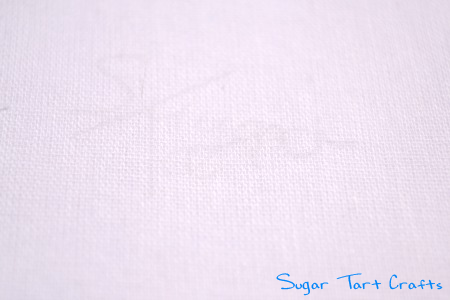 There are so many choices when it comes to tracing a pattern or transferring markings to fabric. It is best to use a tool that is suitable for the fabric you are working with, but the most important thing is to always test your pencil/pen/chalk on a scrap of the fabric before starting your project. There is nothing worse than making a lovely white dress only to find that those pink pencil marks can’t be removed no matter how many times you wash it! Trust me. Even if you’ve never had a problem before, you don’t want to push your luck. The worst stains always seem to happen on the most important projects: christening gowns, party dresses, wedding clothes, that special quilt you spent months piecing. Tears are usually involved. Along with a few choice swear words. So…Choose the best option, read the directions carefully, and test it to make sure it is completely removable. Disappearing Ink / Mark B Gone Fabric Pen – One of the most popular fabric pens; I’m sure most of you probably already own one. The disappearing ink becomes invisible a little too quickly sometimes, but the marks from either end have always washed out well for me. Unfortunately, these pens tend to dry out rather quickly, so it is good to have a back-up handy. Tailor’s Wax – Essentially this is a crayon used to mark fabric. Great for marking changes on a muslin, but the marks can be hard to remove. The idea is that the wax will melt away under an iron, but that isn’t always the case. Best on wool fabrics. Water Soluble Pencils – A colored pencil made to wash easily from fabric. These are kind of hit or miss. The brands with harder “leads” need a lot of pressure to make a mark, which can stretch the fabric out of shape. The softer versions often shatter on the inside and you waste the entire pencil trying to sharpen a nice point. Nice for heavier fabrics like canvas or denim. Tracing Wheel and Paper – Basically colorful carbon paper. Great for transferring paper patterns. Curves can be a little difficult sometimes, and the marks will be very faint if you don’t use enough pressure. Good for thin fabrics or paper. Ballpoint Pen – There is almost always one of these within easy reach. Sometimes it washes out, and sometimes it doesn’t, but if you are only tracing around the edge of a pattern that shouldn’t matter. Works on most fabric that don’t have a nap. Sharpies – I have a whole stash of these, so I use a different color each time I do a fitting on a new muslin. No one is going to see it but me, and the lines won’t fade or wipe away. They are also great for tracing patterns onto fleece since they leave a much bolder line even when dragging through the nap. The larger ones tend to bleed on natural fibers, and you should always make sure the mark is dry before cutting out your pattern. Some of my shears still bear the colorful marks from wet ink. 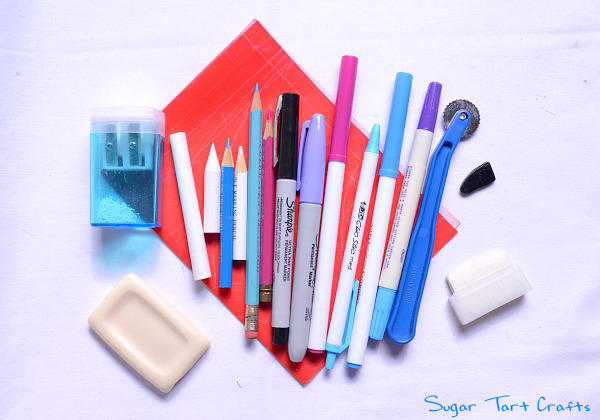 Washable Markers – I use the Crayola: Super Tips. These are almost the same as Sharpies, except that the marks wash out. Sometimes. Not as good on fleece though since the ink tends to smear around on synthetic fibers rather than dry. 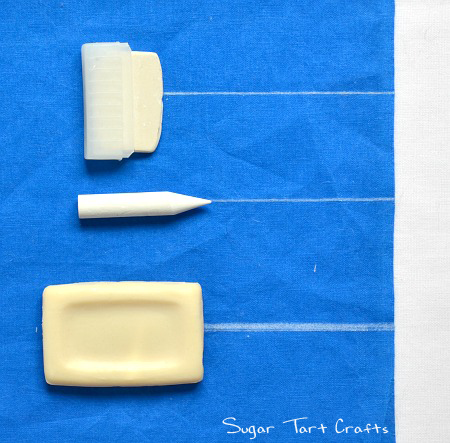 Tailors Chalk – Flat pieces of square or triangular chalk. 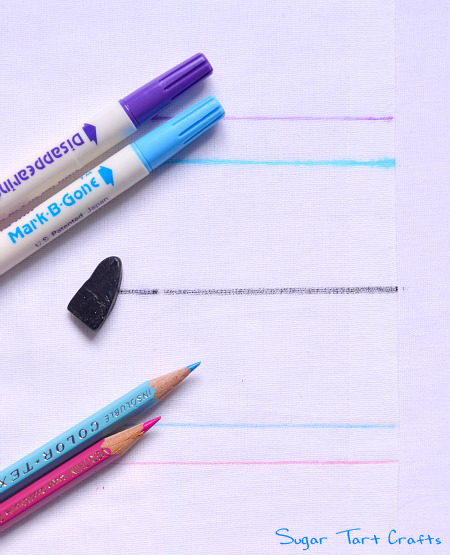 They are great for marking straight lines like hems on darker fabrics. This version in the plastic holder has a small metal V attached to the lid that can be used to sharpen the edges. 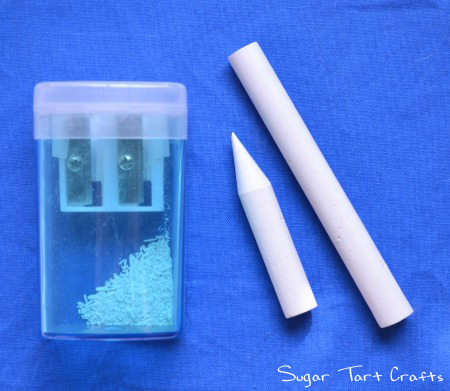 Chalk Sticks – Just plain stick chalk like you used in school. It can be used with a large sized pencil sharpener to produce a very sharp point. You do have to sharpen it constantly, but at 50 cents for a whole box, the savings are worth the effort. Soap Slivers- I know it sounds a little odd, but these are awesome for dark fabrics, and since it’s soap you know it will wash out! If you don’t use bar soap regularly at your house, try a mini hotel soap instead. This last one I was just introduced to this past week, and I must admit they are pretty amazing pens! 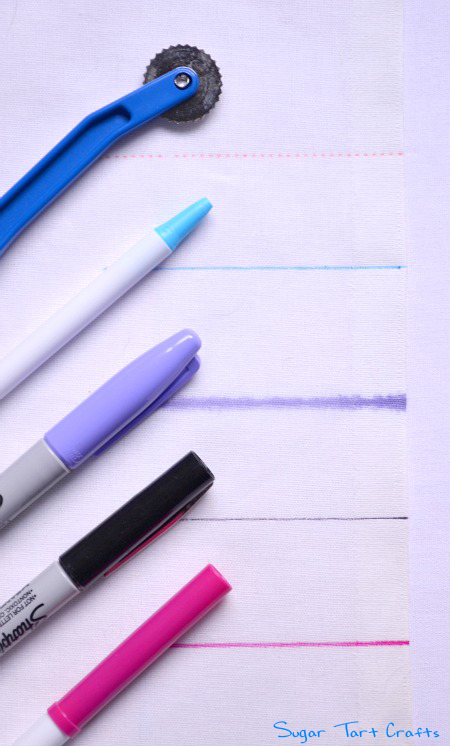 Pilot FriXion Erasable Gel Pens – the heat from an iron causes the ink to disappear. Can you still see the mark below? There is a very faint hint of residual ink even after I rinsed the fabric with water, but I’m sure that would be completely unnoticeable on a printed or colored fabric. The funny thing is that the pens sorta work like color changing doll hair. If you freeze the fabric, the mark will return faintly, and if you leave the pen in a hot car, the ink will turn clear. If you own one of these, I know you want to go experiment now! Chalk Wheel – A trace wheel inside a small box of powdered chalk. As you roll the wheel along your fabric, powdered chalk is deposited along the line. Since the chalk is laying on top of the fabric rather than pressed into it, the dust brushes away very easily. Soapstone Marking Pencil – A piece of soapstone comes in a stick like chalk, and is held in a similar holder. It’s supposed to make a faint white mark that is easily wiped away, but they are becoming difficult to find, so I’m not entirely sure how well they work. Chalk Pounce Powder – Mainly used by quilters; This is essentially a small bag filled with chalk powder that you tap against a stencil. The chalk is forces through the negative spaces and leaves an image behind when the stencil is removed. They always remind me of the little rosin bags used by bowlers and pitchers to keep their hands dry. Are there any that I’ve missed? 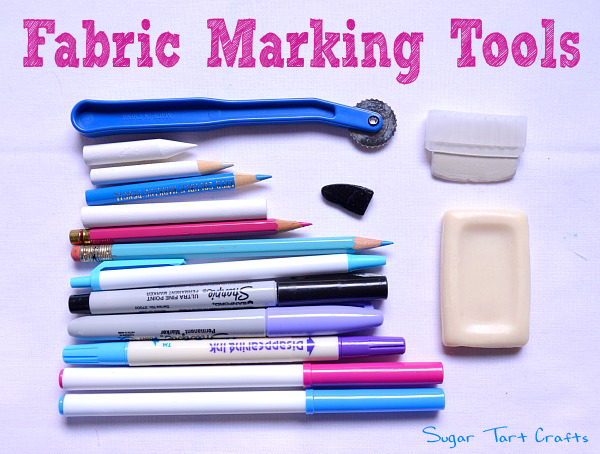 What is your favorite fabric marking tool? Do you have a horror story you’d like to share? Find more Tips of the Week posts here. I use the Clover chalk rolling pen and I love it! Thin line, no need to sharpen, brush or wash away easily, but can become almost invisible with a lot of manipulations. Thanks for sharing! I'll have to look into those. Thanks Lois! I'll be on the look out for one of these the next time I'm at the fabric store. I use cheap washable felt pens intended for children, and I ALWAYS test them first. I also iron over tehm once before washing as heat can also set some inks. Living i the Philippines, I can't buy any of the fancier options as they are not available here. Great point Karen! Ironing is one of the top reasons that most marking pens can't be removed. It can be such a pain if you press each seam as you sew like you're supposed to! Hi Deby! The soap works great on darker fabrics! It's especially good for something like wool where the fuzzy fibers make marking harder. I use my tracing wheel sometimes, but I always wish that the sheets of paper were larger. Maybe I get a roll like you use instead. I've tried many of the ones mentioned with some success. Right now I'm using Singer water soluble disappearing ink pen. It's not totally disappearing but I've learned the hard way to use light pressure for a faint line just in case it doesn't go away. Nice article very helpful. Pinned. I'm always worried that the marks will disappear before I get my project done. I have't tried the Singer brand pen yet though, so maybe that one lasts longer than mine. Thanks for visiting Patty! I use Crayola markers – with kids there are always a couple close by and I can use a color that will show up on my fabric. Sometimes the sewing-specific markers are hard to see on darker or patterned fabrics. I'll be sure to try a hotel soap when I work on black – thanks for the tip! Hi Bobbi! That's how I started using crayolas too. My daughter was coloring next to me one day and I just sorta grabbed a marker and went to town. It's really nice to have so many colors to choose from. Thank you! I was wondering what soap slivers are. Remember we were using just old small leftover soaps for dark fabric – cheap and easy. A note on the frixion pens..which i have a love hate relationship with….I ran some tests when they first came out and its important to note that starch sets the ink making the shadowing permanent. So don't starch your fabric before you start to draw. Also, don't use the frixion pens on something you're intending to use out and about in winter. A ton of bright pink lines just started randomly appearing on my beige bag this last winter while I was out shopping. Oops! I used air disappearing pen on my swap tote and even though the ink had disappeared, when I ironed the quilting on the panel the lines started reappearing so I had to handwash the panel before putting the bag together. Nightmare!! Really not what you want when you've already applied the soft & stable! Good to know ladies! Only use those pens on non-starched summer clothes. Guess we all knew there had to be a down side to such a neat pen! So many! My absolute favorite is the waxy tailor's chalk. The kind I use doesn't have a little finger piece and steams/washes out of everything. I've only seen it leave a slight residue on silk which I rarely use. Thanks for all the great information! Do you happen to remember where you got your wax chalk? Mine is such a little nubbin', but I've only been able to find them by the case. Frixion pens..my latest favorite…nice crisp dark (pale yellow for dark fabric) lines, disappear with a little ironing, and reappear with a shot of cold (freezer), if needed! I love the pilot Frixion pens! When you iron over the marks, they definitely disappear. I have used black on white fabric and cannot tell where the mark is. Just be careful. If you don't iron all of the ink out before you wash it, it will set it. And yes, if you accidently iron over the marks, just put the fabric in the freezer (insert hubbys confused look here) and after a few hours they will be back. They come back faintly after about 1/2 hour. What a great tutorial!! I'm pinning this 😉 Thank you so much for sharing at Give Me The Goods Monday! Thank you Toni. This page is fantastic and exactly the info I needed to mark my chocolate brown fabric. You're very welcome Michael. I'm happy to help! Ugh, the carbon paper always tests my patience! It can definitely be a trial and error process. Great reminder too! Rubbing alcohol works like a charm on sharpie ink. I like to use those little wipes from the doctor's office. Thanks for visiting Miriam! I use tailor's tacks. This method was shown to my by my grandmother 40 years ago and I find it to be the best method. With this method this markings are in the exact same spot on the fabric as they are on the pattern. Using a long section the thread is less likely to pull out. No worries about inks, pencils, or chalk remaining. Terrific post! I see a few new products I need to try! Thanks! After spending quite a lot on various washable fabric pens, I bought a pack of Bic Washable Felt Tips from Tesco for about £3. I tried all of them on various white fabrics and tried setting them with a hot iron. Only the pink didn't come out so I binned that one. The rest will last me ages. I still haven't found a method I really like for marking lines and dots on dark, woolly fabrics. I actually just use a regular pencil lightly on the reverse side of fabric for cutting. For marking the fabric in order to line up embroidery, I use painter's tape and a pen. This way I do not make any marks on the fabric that I need to worry about. For those looking for soapstone chalk, check out your local hardware store. They are used for marking metal, like in welding, and they have round and flat pieces. Found them on Amazon as well made by Hobart. My longarm quilter marked her custom quilting design using blue water-erasable pen on a quilt I made for my church. When it was returned to me for binding, I spritzed the marks with water, leaving the quilt flat to dry. Next morning I turned the quilt over and found pink splotches in four places. It seems one or two of the red fabrics I used have bled onto the pale backing fabric Nightmare! I wonder if red embroidery thread also runs if a project is dampened to remove these water-erasable marks. My quilter says she normally submerges quilts in the bathtub to remove her marks. I can imagine an even greater nightmare with fabrics bleeding dye if I’d used her method. Soapstone pencils are used to mark metal for welders. So you can find them in the tools section, usually.